National Trust staff and volunteers are to start work on clearing a section of river above Boscastle, devastated by floods in August. On Thursday the team will start to clear trees and debris from the Valency River, upstream of the village. 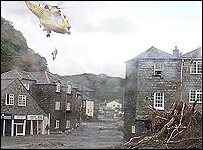 The flood water swept down the Valency valley as it headed towards Boscastle. The trust says the valley is one of the finest examples of western oak woodland in Britain and many ancient trees were uprooted during the flood. The National Trust's assistant property manager in North Cornwall, Jeff Cherrington, says they need to clear the area of the fallen and broken trees that were caught up in the flood. He said: "We are pretty much going to be starting at Boscastle and moving up the valley. "We will be removing any bits that we can identify, taking them above the flood plain so they are not going to come down into the village in the future." Two hundred tonnes of stone which was washed into Boscastle's harbour has already been recovered. Eventually the stone will be used in the rebuilding of walls at the harbour and in neighbouring gardens.